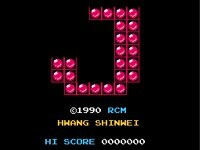 Magic Jewelry (Chinese: 魔法寶石; pinyin: Mófǎ Bǎoshí; literally: "Magic Gems"), is an unlicensed Nintendo NES tile-matching puzzle video game derivative to Columns, which was programmed in Taiwan by Hwang Shinwei and published by RCM in 1990. This title is common on pirate Famicom multicarts and systems; for example, it's built into the Dynavision and Power Player Super Joy III but also existed four hacks, called Coin Tetris, Abacus, and Jewel Master dualogy (the second is on N-Joypad, while the last two respectively on VG Pocket Max and Caplet). Various unofficial remakes have been released for iOS and Android.